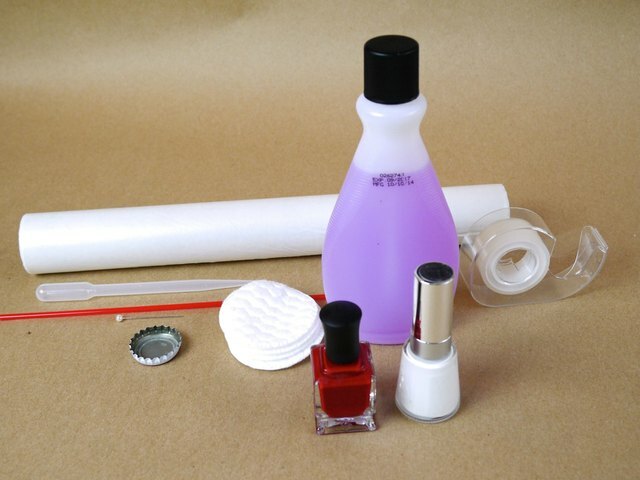 Before beginning your manicure, cover the work surface with wax paper. Start with dry, white nails before beginning. 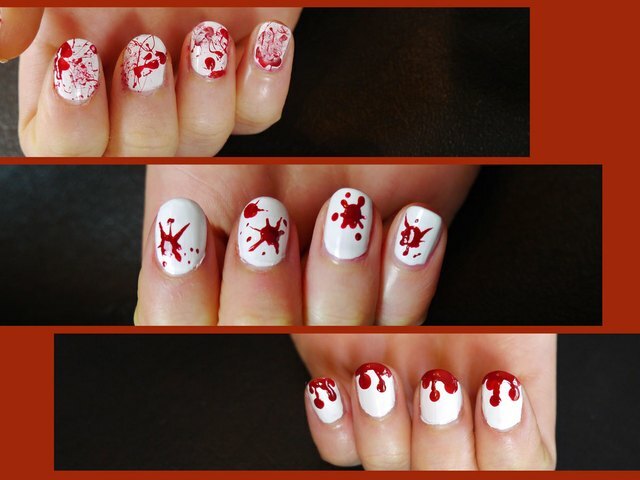 Tape the skin around each nail with clear tape to protect the fingers from excess splatter. 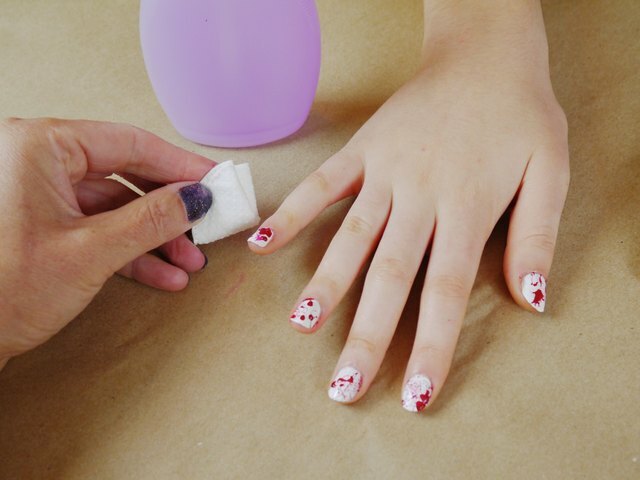 Begin with a small strip of tape right under the cuticle, across the front of the finger. Use a second strip and arch it over the top of the finger, along the outer edge of each nail. Fold the excess tape to the back of the finger. 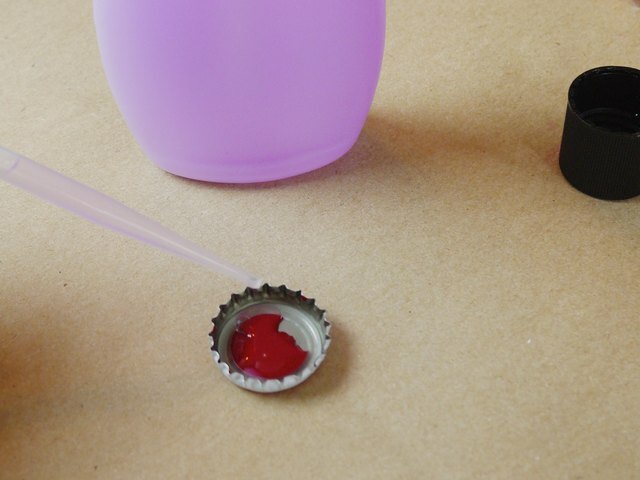 Place five drops of red nail polish into a bottle cap. 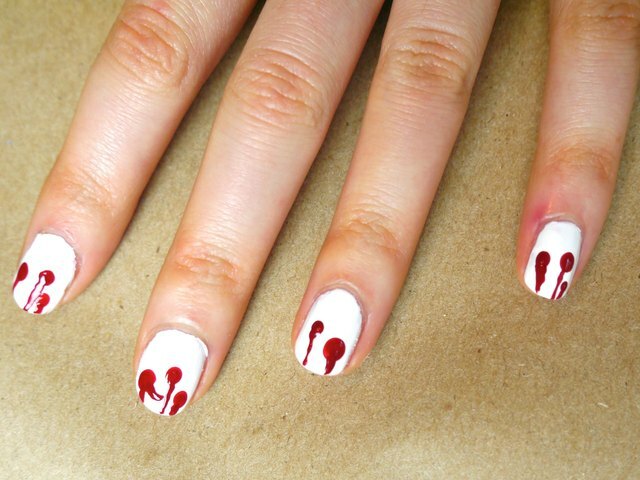 Use an eyedropper to add two or three drops of nail polish remover into the red polish. Mix with a cocktail straw. This will thin the polish so it splatters easily. Dip the tip of the cocktail straw into the diluted red polish, completely covering the tip. Then, place it 1 inch from the surface of a nail and blow nail polish out through the straw. 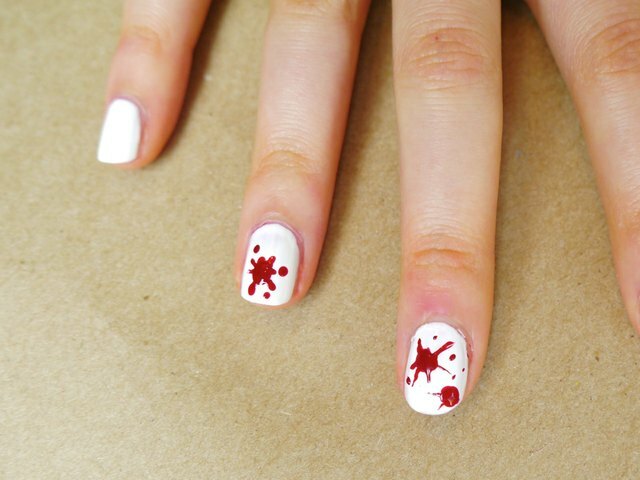 The paint will splatter over the white surface of the nail. Continue on all of the nails. 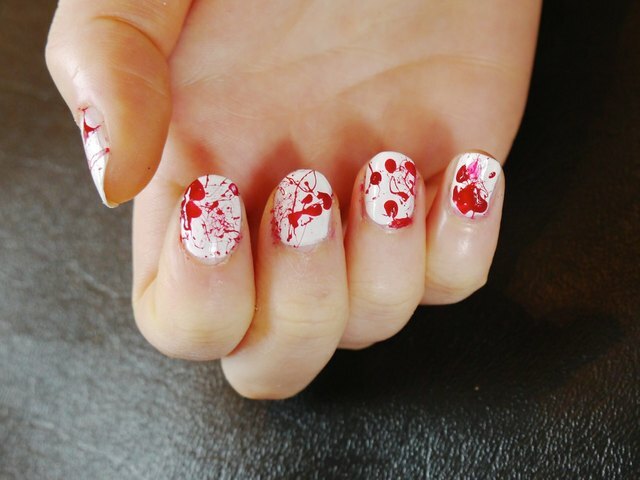 Once the nails are covered in red splatter, remove the tape and touch up any unwanted splatters with a cotton pad dipped in polish remover. Allow nails to dry. Start with dry, white nails before beginning. 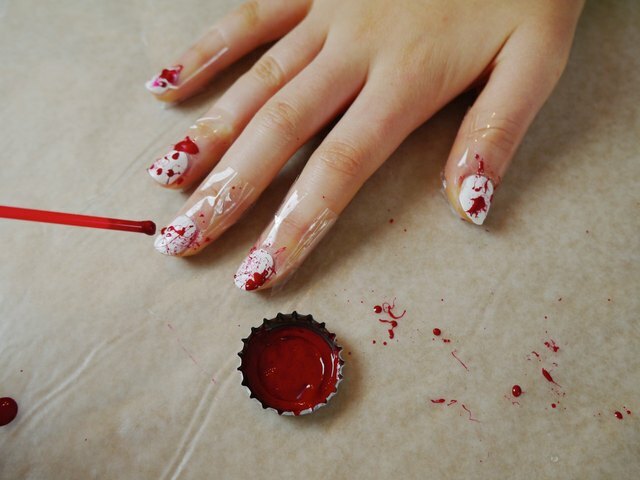 Add a couple of drops of red nail polish to a bottle cap or another shallow dish. 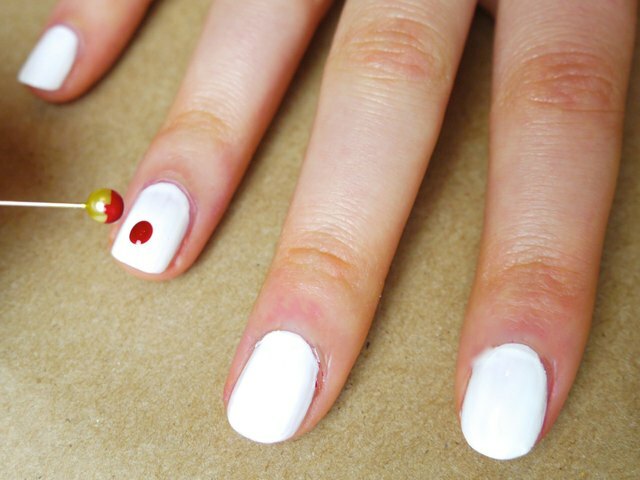 Dip the rounded end of a straight pin into the polish and dot onto the nail where you would like a splat. Turn the straight pin around (or use a new pin) and pull the red polish from the center of the splat out into the nail, forming several splat lines. 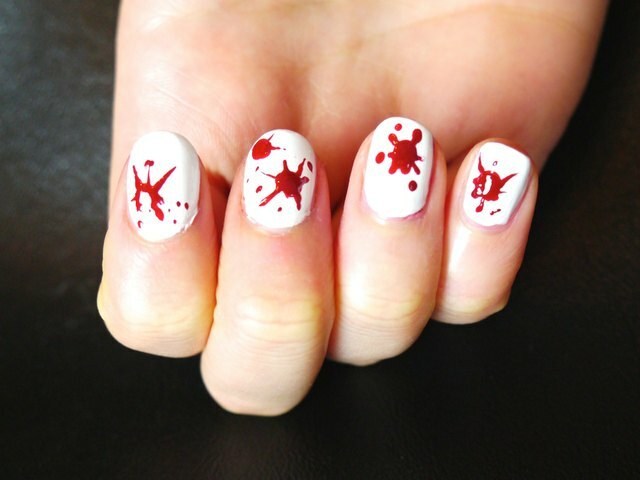 Continue using the same technique on all nails, dotting polish and then pulling it from the center of the splat mark to the outer nail, forming various streaks and dribbles. 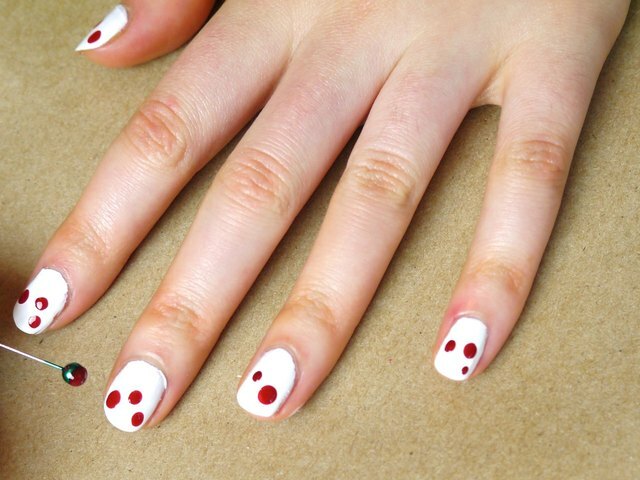 Add smaller dots or flecks of red polish around the main splat marks using the tip or round side of the pin. Allow nails to dry. Start with dry, white nails before beginning. Add a couple drops of red polish to a bottle cap or another shallow dish. Use the rounded end of a straight pin to add two or three dots to each nail in a staggered pattern. 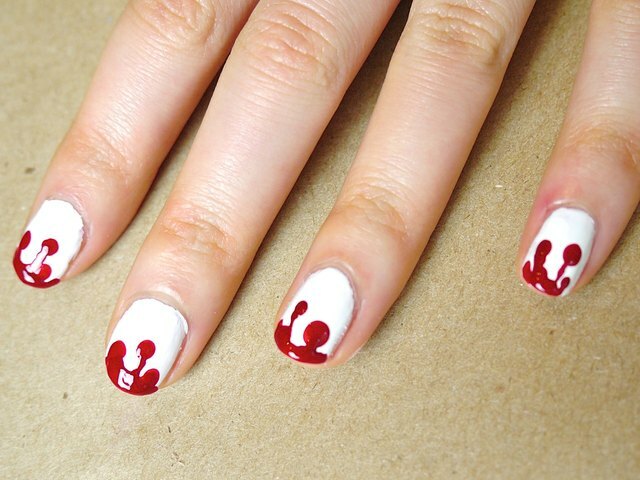 Dip the end of a straight pin in the red polish and draw lines from the tip of the nail to the center of the dots. Some lines can be thicker than others. 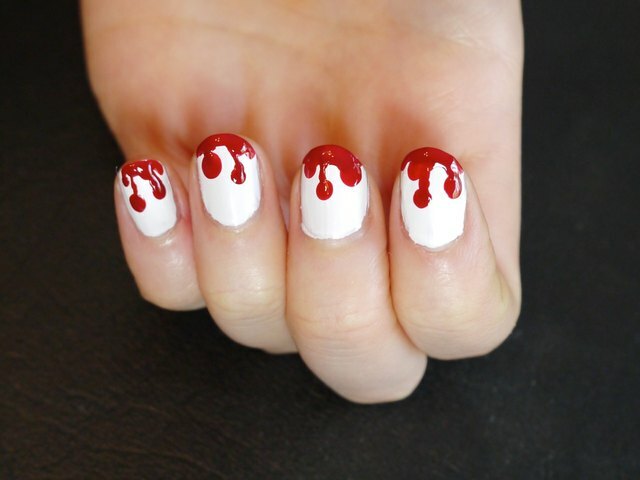 Finish this technique by using the nail polish brush to paint the tips of each nail red. Allow nails to dry.